The Regatta Lepa festival is famous Dragon Boat Race taking place every year in April in Semporna (21 - 23 Apr 2017). The festival was introduced to honour the legacy of the Bajau Laut, a nomadic community of Sea Gypsies, whose connection with water is legendary. Lepa is the name of the single-mast sailing boat traditionally used by them. The Regatta Lepa is an annual Sabah State event, and year after year this festival attracts more and more people from all nationalities and backgrounds. 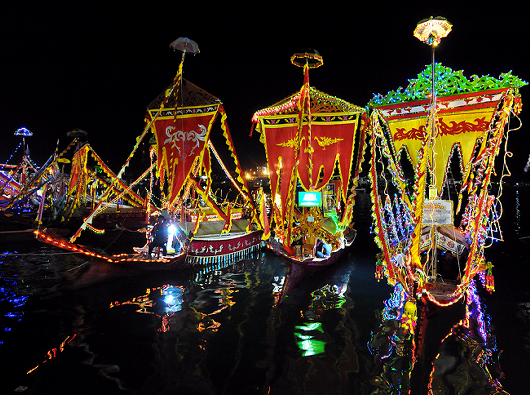 The Regatta Lepa is a water parade of colourfully decorated boats alive with singers and dancers inside, all representating a particular family or village. Another feature of the festival is a race of small dugout boats called kelleh-kelleh. Besides these, there are generally a tug of war, and a duck-catching contest. The Regatta Lepa festival continues late into the night with the Lepa beauty pageant, fireworks, cultural and traditional shows and games, fireworks and the famous igal-igal dance of the Bajau people. The word igal is a sort of corruption of the word ‘eagle'. The dance is so called because of the eagle-like, smooth movements that dancers make. Within Semporna stadium, a 'Lepa Car' contest is also held. 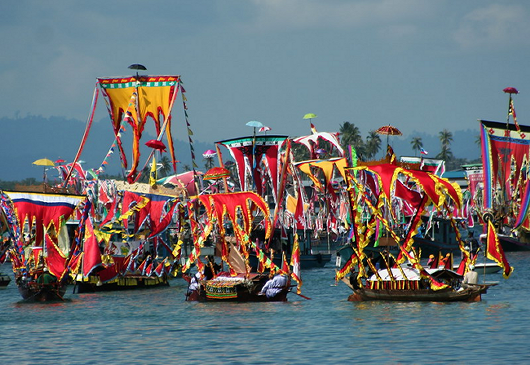 The high spot of Regatta Lepa is a decorating contest between the rainbow-coloured Lepas. The beauty of these vessels is further enhanced with colourful umbrellas, flags, streamers, and bunting. The winning boat is given a cash prize of thousands of Ringgits, a certificate, a trophy, and may also get additional rewards. The yardsticks for selecting the best boat are the quality of the boat's sails (sambulayang), triangular pennants (tipas-tipas), rectangular flags (panji-panji), and the boatmen's song and dance performance. Those, who are keen to enjoy the full-spectrum flavours of the festival, can follow the Lepas in a rented boat. The Lepas were in use from the 14th century itself when the entire life of the Bajau Laut was lived within these boats. They earned their living with these boats and conducted all their ceremonies from birth to death within them. Contact us for more information about the Regatta Lepa.